The funeral of Prisoner Maysara Abu Hamdiyeh started in Hebron in a large military procession attended by thousands of Palestinians, Palestinian official news agency WAFA reported. The body of Abu Hamdiyeh, wrapped in the Palestine flag and the traditional headscarf Kufiya, was taken in a national security vehicle to a mosque to be prayed on then to the Martyrs Cemetery, where he will be buried. Shops in Hebron closed their doors in a general strike over the death of Abu Hamdiyeh, who died of cancer while in Israeli detention due to medical negligence. Gaza premier Ismail Haneyya reached the son of Maysara Abu Hamdiya, who died of cancer in Israeli jails, on the phone on Wednesday evening. Haneyya extended condolences over the death of the father to his son and hailed his national role and history of struggle against occupation. The premier held the Israeli occupation authorities fully responsible for the death of Hamdiya, 64, in custody. Maysara Abu Hamdiya who hails from Al-Khalil, died in Soroka hospital on Tuesday of throat cancer. He was denied proper medical treatment on the part of the IOA that even refused to release him at his last days. Below is unofficial translation of a memorandum filed by Rami Alami, an attorney for Ministry of Prisoners Affairs, after a visit to the late prisoner Maysara Abu Hamdiya on March 12, 2013. The lawyer's last visit to Abu Hamdiya was on March 31, a day after he was transferred to Soroka hospital after he fainted in Eshel prison. "The detainee came to see me in a very bad state. I had visited him before 9 months but this time, he looked really tired and weak. He seemed like a different person unable to walk without the assistance of other detainees. He couldn't move his legs; his voice was husky and hardly audible. In fact, prisoner Amjad Kabha, who was accompanying him, had to relay to me what [Abu Hamdiya] said because I couldn't make out what he was saying. "After asking him about his health condition, the prisoner said that his health started to deteriorate since August 2012 when he suffered severe throat ache accompanied by swelling in lymphatic and salivary glands. During that period, the prisoner was in Al-Ramoon prison; he went to the prison clinic and was given anti-biotic medications without any tests. Afterwards, the prisoner was given an flu shot after which he immediately suffered chest pain and general aches. The prisoner went once again to the clinic and described his condition to the doctor, who refused to further investigate his condition. "After pushing the issue with the prison clinic, it was approved to send him to the hospital in October. The date was then delayed to November then delayed again until December. When he went to Soroka hospital in Bir Sheva, the hospital was told that he was brought to the hospital due to eye problems and not because of the pain he suffers in the lungs and chest. Prisoner Abu Hamdiya was then returned to Alramoon prison without doing the needed tests. "During this period, the prisoner said he began to lose a lot of weight; in fact he lost about 14 kilograms of his weight. On the 10th of January 2013, he was taken to Surka hospital once again, where an ultrasound of the neck was conducted after which a specialist that a biopsy showed he cancer cells in the throat area and that those cells had apparently spread to surrounding glands in the neck area. "On 17 January 2013, the prisoner was brought back to Suroka hospital, where he had an endoscopy procedure for the throat area. During this period, Abu Hamdiya was suffering from cute throat pain, difficulty swallowing and breathing, phlegm in chest, and suffered from dyspnoea. Throughout that period and until this date, the prisoner wasn't given any treatment. "The prisoner added that on 24 January 2013, he was sent to Al-Ramla hospital for a chest radiogram and later sent back to prison. He said that the trip from to and from the hospital was very difficult; said he suffered and his pain kept getting worse. Due to his severe pain, he was given pain killer (Voltarin) suppositories, as he was unable to take painkillers orally because of his acute stomach infections. "Two weeks later, Abu Hamdiya was transferred to Asaf Harofeh hospital, where he underwent an MRI test of the chest, neck and glands. A gallium scan was also conducted and it was the most painful test of all. "The doctor at the Asaf Harofeh hospital said more tests were needed to reach a cancer diagnosis and determine its type in order to administer the proper treatment. The doctor also informed ABu Hamdiya that he would be transferred to a hospital in Jerusalem, where more tests will be administered and then he would be sent to a specialist in Soroka hospital. Abu Hamdiya said that on Sunday 10 March 2013, he was transferred from Ramon prison to Eshel prison because, as he was told, it was closer to Soroka hospital. According to the prisoner, on March 12, 2013, he was sent to Soroka hospital, where more tests were administered under full anesthesia, including a throat and abdomen endoscopy. When he came and asked about the results, Abu Hamdiya was told that the results were sent to the doctor in Eshel prison. "The prisoner said that until this day, he has not received any treatment and that he has only been given painkillers. He confirms that this health is deteriorating with each passing day. Abu Hamdiya has loss of appetite, difficulty in swallowing and acute pains in his body, especially his muscles and ribs. He cannot sleep, day or night, from the pain. He also cannot walk or get to the bathroom without the assistance of other prisoners. ABu Hamdiya cannot stand on his feet and he lies in bed most of the time. He said that he went to the prison clinic and asked them for medication or supplements to improve his appetite but the clinic ignored his request. "Au Hamdiya called on all free men in this world and all human rights and international organizations to step in and help save his life and cease Israel's policy of medical negligence." Hamas spokesman Hammad Al-Raqab on Tuesday held the Israeli regime fully responsible for the death of prisoner Maisara Abu Hamdiya in one of its jails. Raqab made his remarks in a speech during a massive rally in Gaza protesting Abu Hamdiya's death. Spokesman Raqab also held the Palestinian authority responsible for the death of Abu Hamdiya because of its involvement in security cooperation with the Israeli occupation against the Palestinians and their resistance in the West Bank. The Hamas spokesman called on the PA to order its security apparatuses to stop targeting the resistance in the West Bank and enable it to confront the occupation and defend its people. For their part, the prisoners of Hamas in Israeli jails mourned in a statement on Tuesday the death of Abu Hamdiya and described him as one of Al-Qassam Brigades' great leaders and martyrs. The Hamas prisoners also said that the blood of Abu Hamdiya would never go in vein and vowed to avenge his death sooner or later. In this regard, tens of thousands of Palestinian citizens participated yesterday in massive rallies organized by Hamas in different areas of the Gaza Strip denouncing the death Abu Hamdiya and demanding the resistance to avenge his death. The central march was held in Gaza city and the crowds moved to the mourning tent that was erected in Al-Saraya square. Another march also moved at twilight from Al-Sunna Mosque in Khan Younis to Naser hospital amid chants condemning Israel's crimes against the prisoners and urging the resistance to kidnap Israeli soldiers. Similar marches also took place in Rafah area and the north and central areas of the Gaza Strip. A Palestinian prisoner, Maysara Abu Hamdiyeh, died in the Israeli jails. The death of Abu Hamdiyeh can be labeled as direct assignation where Israel left him to die without providing him the required medications. Abu Hamdiyeh suffered larynx cancer for the past few months. Despite his chronic disease, Maysra was medically ignored by Israeli prison authorities. He was denied health care and admitted to the hospital very late. According to his family, many requests were made so specialized doctors can see him. However, the Israelis refused all those requests and continue to give him normal pain killers instead of real medical treatment. UFree Network to defend the rights of Palestinian Prisoners denounced the assignation of Abu Hamdiyeh as well as his prison inmate, Arafat Jardat who was killed in similar conditions last month. The network considers the case of Palestinian prisoners as an urgent matter that requires real actions and not only verbal condemnations. · A political move is required from Palestinian leadership who signed Oslo accord which resulted in the current de facto. The leadership must seek a resolution from the United Nations which practically protect prisoners. It's also demanded to get the membership of the International Criminal Court (ICC) thus; Israeli leadership can be held accountable for its crimes against the Palestinian people and prisoners. · Arab/Muslim masses are required to act and protest in front of the UN premises in their countries. Such pressure will contribute to create a mainstream on the agency thus it can't remain silent. · Arab/Muslim communities in Europe are invited to carry out actions in front of Israeli embassies as well as the UN to draw an attention to what's going on. European Union must be also pressured thus it freezes its relation with Israel due to its constant human rights violations. United Nations Special Coordinator for Middle East Peace Process, Robert Serry, expressed concern over mounting tension in the region following death of Palestinian prisoner Maysara Abu Hamdiya and rocket attacks from Gaza into Israel. Serry said in a statement that he is "worried about the volatile situation on the ground, as exemplified by renewed firing of rockets from Gaza into Israel yesterday and this morning, and continued tensions over unresolved prisoner issues." He said, "It is of paramount importance to refrain from violence in this tense atmosphere and for parties to work constructively in addressing the underlying issues." The UN official warned that "the renewed violations of the ceasefire risk undermining the 'understanding' reached between Israel and Gaza on 21 November, and unraveling the gradual but tangible improvements achieved since then in the easing of the closure and the security situation in Gaza and southern Israel." Lebanese President Michel Sleiman has condemned the Tel Aviv regime over its negligence toward the humanitarian conditions of prisoners in Israeli jails following the death of a cancer-stricken Palestinian inmate. Abu Hamdiah, who suffered from throat cancer, lost his life in an Israeli prison due to the lack of medical care on Tuesday. The 64-year-old inmate was reportedly from the occupied West Bank city of al-Khalil (Hebron). Sleiman further called on the international community to press the Israeli regime to respect international treaties on prisoners' rights. “Israel, which fights unarmed Palestinians with warplanes and tanks, is refraining from providing care for sick prisoners,” the Lebanese president added. On Tuesday, acting Palestinian Authority Chief Mahmoud Abbas said he held the Israeli regime responsible for the death of the Palestinian detainee. The death of Hamdiah has sparked widespread outrage across the Palestinian territories. Earlier in the day, Israeli forces fired tear gas to disperse Palestinian protesters who had taken to the streets in the southern West Bank city of al-Khalil (Hebron) and the town of Beit Ummar. Meanwhile, people also observed a general strike across the Palestinian lands to mourn the death of Abu Hamdiah. More than 4,500 Palestinian prisoners are being held in Israeli prisons, many of them without charge or trial. The international assembly for breaking the chains said that the Palestinian prisoners in Israeli jails raised five essential demands on Tuesday after the death of prisoner Maisara Abu Hamdiya. The assembly stated that the captive movement submitted its demands in writing to the Israeli prison authority calling for providing jails with fully equipped ambulances and improve the services and equipment in the infirmary of the Ramla prison to become suitable for medical treatment. The prisoners also demanded the Israeli jailers to give them without exception regular medical checkups, provide the patients with chronic health problems with extensive medical care, release those terminally ill and allow doctors from outside the jails to visit them. The prisoners affirmed that they insist on their demands and would keep their struggle until they extract their legitimate rights. Dr. Atallah Abu Subbah, Minister of prisoners' affairs, announced the martyrdom of prisoner Maysara Abu Hamdiya in Soroka hospital in occupied Beersheba, holding the Israeli government fully responsible for his death. Abu Subbah said during a press conference at the government media office on Tuesday that the time has come to revolt against the Israeli practices and crimes against Palestinian prisoners, calling for a third intifada in response to the prisoner Abu Hamdiya's martyrdom. The Captive Movement's martyrs’ number has reached 208 martyrs in Israeli jails, he added, warning against increasing the martyrs' number. Abu Subbah called on the Arab League to take serious positions toward the prisoners' issue to save the rest of prisoners' lives. At the same time, he called on media to expose the crimes of the occupation to the world, denouncing the absence of Palestinian prisoners' issue in some Arab media. He explained that the prisoners in Israeli jails have declared a mass hunger strike mourning the captive Abu Hamdiya, demanding Palestinian Authority in Ramallah to stop the absurd negotiations with the Israeli occupation. The martyr Abu Hamdiya had been suffering since his detention from throat cancer that has spread all over his body, as a result of the Israeli medical negligence. The Islamic Resistance Movement Hamas called for a mass protests in support of the prisoners in Israeli jails, saying that the occupation will regret its crimes. Dr. Sami Abu Zuhri, Hamas spokesman, confirmed on Tuesday that the movement follows with great concern the serious developments in Israeli jails, where the captive Maysara Abu Hamdiya was martyred in Israeli prisons after occupation authorities refused to release him despite his serious health condition. The martyrdom of Abu Hamdiya proves the Israeli arrogance and of the danger that rings the alarm bell for the Palestinian prisoners' lives in Israeli jails, Abu Zuhri added. Hamas spokesman called on PA Chairman Mahmoud Abbas to prosecute the occupation war criminals in the International Criminal Court (ICC), calling on Cairo and all Arab and international parties to bear their responsibilities to stop the Israeli violations and crimes against the Palestinian prisoners. President Mahmoud Abbas said that the arrogance of the Israeli government stopped in the way of responding to Palestinian efforts to secure the release of the prisoner Maysara Abu Hamdiyeh, who died in prison due to medical negligence by the Israel Prison Service. He said at the opening of a meeting for his Fatah Central Committee in Ramallah that the Palestinian people were shocked when they heard of Abu Hamdiyeh's death of cancer in the Israeli prison. "We tried working on Abu Hamdiyeh's release due to his medical condition, but the Israeli government refused to respond to the PA's efforts in releasing him, which led to his death," he said. "This shows the intransigence and the arrogance of the Israeli government especially toward prisoners of freedom held in its jails," he said. Prime Minister Salam Fayyad called on the international community and all humanitarian organizations to force Israel to open its jails for international monitoring following reports of mistreatment of Palestinian prisoners. Fayyad's call came following the death of Maysara Abu Hamdiyeh, who died Tuesday morning of cancer while in detention. He called for a fact-finding committee to investigate treatment of prisoners in jails, particularly those with serious health condition. Fayyad strongly condemned what he described as Israel's policy of deliberate medical neglect against prisoners which caused the death of Abu Hamdiyeh. Around 4,500 Palestinian prisoners in Israeli jails sent back their food this morning as part of a protest launched following the death of their fellow prisoner, Maysara Abu Hamdiyeh, who suffered from cancer. 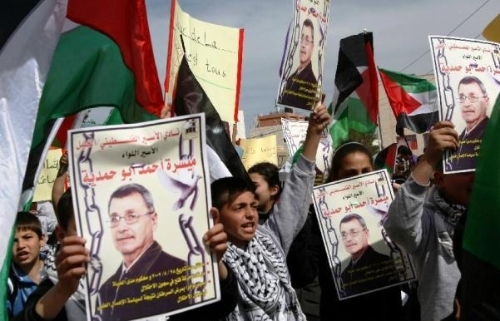 Palestinian prisoners also launched a three-day hunger strike following the death of 64-year-old Abu Hamdiyeh, who was serving a life term in Israeli prison. An autopsy of Abu Hamdiyeh's body was scheduled to take place Wednesday at the Institute of Forensic Medicine at Abu Kabir in Tel Aviv in the presence of a Palestinian observer. The body will then be transferred to the Palestinian Authority for burial. Abu Hamdiyeh's funeral was scheduled to take place Thursday in his hometown of Hebron. Protests immediately erupted in the West Bank, east Jerusalem and in Israeli prisons on Tuesday over his death. More protests are expected to break out at his funeral in Hebron on Thursday. Protestors and the Palestinian Authority (PA) blamed on Israel for medical negligence and bare Israeli authorities the full responsibility for Abu Hamdiyeh's death. Abu Hamdiyeh was claimed a hero and a martyr. The Palestinian prisoners in all jails decided yesterday to go on hunger strike for three days in protest at the death of prisoner Maisarra Abu Hamdiya. Many jails also saw clashes and protests immediately after the prisoners heard about the death of Abu Hamdiya. According to Ahrar center for prisoner studies and human rights, the notorious prison units of Nahshon and Massada were called in and suppressed the prisoners. About 30 detainees were reportedly injured when these units attacked them, while the prisoners of section 1 in Raymond jail burnt an Israeli flag and trampled on it and others broke a surveillance camera. Palestinian storeowners decided to participate in commercial strikes in Jerusalem and the West Bank on Wednesday in morning for prisoner Maisara Abu Hamdiya who died yesterday in an Israeli jail. A general strike started in the morning today in occupied Jerusalem following a violent day of repression by the Israeli police forces that attacked a peaceful rally organized in Bab Al-Amoud district in protest at Abu Hamdiya's death. Most of the Jerusalemite storekeepers refrained from opening their businesses in response to strike calls. The Palestinian natives of Jerusalem also decided to stage a protest outside the Israeli magistrates' court to demand the release of 11 Palestinians who were detained in the police attack on the rally of Bab Al-Amoud. For its part, the coordination committee of factions in Nablus city also called today for a strike in mourning for Abu Hamdiya. Other West Bank cities have also seen today morning similar one-day strikes, except for Al-Khalil city, the hometown of Abu Hamdiya, which declared a strike for three days. Hamas expressed its condolences to the Palestinian people and the heroic prisoners for the martyrdom of the prisoner Abu Hamdiya, 64, from the city of al-Khalil on Tuesday in Soroka hospital due to the Israeli medical negligence. The prisoner Maysara Abu Hamdiya had been suffering from throat cancer where the Israeli authorities refused to release him despite his health deterioration. "We in Hamas movement hold the Israeli enemy fully responsible for the martyrdom of captive Abu Hamdiya, we consider the Israeli medical negligence and the Israeli refusal to release sick prisoners as a crime against humanity and deliberate targeting of the prisoners' lives in total violation of the international norms and laws", the movement said in its statement on Tuesday. The movement warned the occupation of continuing its criminal policy that threatens the prisoners' lives in its jails, calling on human rights and humanitarian organizations to immediately intervene to save thousands of Palestinian prisoners in occupation prisons and to prosecute the Israeli leaders for these brutal crimes against prisoners. A Palestinian prisoner, who suffered from cancer, has lost his life in an Israeli jail due to the lack of medical care, as the plight of Palestinian inmates continues in Israeli detention facilities. Palestinian Minister for Prisoners Affairs Issa Qaraqe said Monday that medical negligence in the Israeli regime’s custody led to the death of Maisarah Abu Hamdiah. Abu Hamdieh was transferred to a hospital in Tel Aviv after he fell unconscious on Monday. On Sunday, Qaraqe said 17 Palestinian prisoners launched a hunger strike in solidarity with their cancer-stricken fellow. Following the report of Abu Hamdiah’s death, acting Palestinian Authority chief Mahmoud Abbas said he held the Israeli regime responsible for the death of the inmate. Meanwhile, Palestinian prisoners held a protest following the death of their fellow inmate due to medical negligence in the Israeli regime’s custody. According to reports, Israeli prison guards fired tear gas to disperse the protesting prisoners. On February 13, Abbas appealed to the international community to intervene in support of Palestinian prisoners on an open-ended hunger strike to protest their detention conditions in Israeli prisons. Several demonstrations have been held across the Palestinian territories to show solidarity with the four men, who are experiencing deteriorating health conditions. The inmates were admitted to hospital on Friday. The prisoners have been on hunger strike for months to protest against their administrative detention, a controversial practice used by Tel Aviv that allows the Israeli authorities to incarcerate Palestinians indefinitely without charging them or holding a trial. Minister of Detainees and Ex-Detainees Affairs, Issa Qaraqe, announced the death of prisoner Maysara Abu Hamdiyeh, 64, a throat cancer patient, in Israeli jail. Qaraqe bare Israeli authorities the full responsibility for the death of Abu Hamdiyeh, who suffered from several diseases in Israeli jail. Qaraqe noted that the Israel Prison Service (IPS), neglected his health condition and didn't provide any medical treatment for him. Abu Hamdiyeh died at 8:00 AM in the ICU at Israel's Soroka Hospital in Beersheva. Abu Hamdiyeh was arrested several times by Israeli authorities, the last one was in 2002, when he was arrested and sentenced to life. The ministry has recently warned of the serious deterioration of Abu Hamdiyeh's health condition. According to the prisoner's lawyer, Abu Hamdiyeh suffered loss of consciousness and had difficulty speaking. The Cancer had spread from his throat to his spinal cord, due to medical neglect. The presidency held the Israeli government fully responsible for the death of Palestinian prisoner Maysara abu Hamdiya, who died due to medical negligence by the Israeli prison services. Presidential spokesman Nabil Abu Rudeina told Palestinian official news agency WAFA, "We warned of this long time ago as the continued arrest of Palestinians and medical negligence lead to serious repercussions." He warned of the continued slow killing of prisoners detained in Israeli jails, calling the Israeli authorities to release all prisoners.